One corned beef brisket can provide enough for several delicious meals. 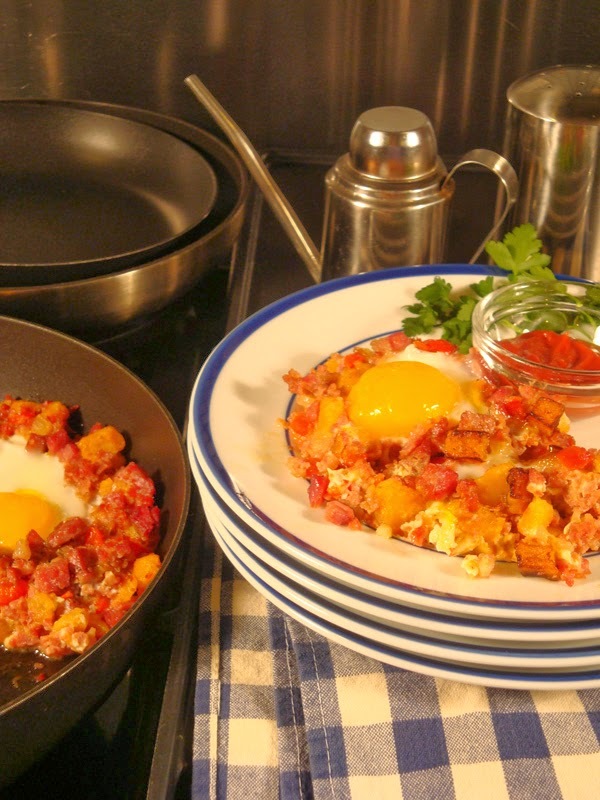 Make Corned Beef and Cabbage for dinner, use some to make this tasty hash for breakfast, then polish off the rest in Reuben Sandwiches for lunch. If you prefer, you can buy corned beef from the deli or even (gasp!) in a can to make your hash. Make Rutabaga Faux Potatoes according to recipe on p. 285 in Nourished or use leftovers from previous recipe here; cut in ¼-inch dice and set aside. Pulse corned beef in a food processor with the metal blade until roughly chopped or chop by hand. Heat fat in a large skillet and sauté onion and bell pepper over medium-high heat, stirring occasionally, until softened, about 5 minutes. Add rutabaga and continue to cook and stir until browned, about 5 minutes more. Stir in corned beef and cook, stirring occasionally, until it is browned. Add Worcestershire and cream and cook, stirring, for another minute. Make 4 depressions in the hash with a large spoon and break an egg into each. Season eggs with salt and pepper to taste. Reduce heat to medium-low, cover pan, and cook for 5 minutes or until egg whites are set but yolks are still soft. Cut into 4 portions. Garnish with fresh parsley, if desired, and serve hot with low-carb Ketchup, p. 294 in Nourished, on the side (optional). Makes 4 servings of 1½ cups each. Preparation time: 15 minutes active, 30 minutes total, excluding time to prepare faux potatoes. Recipe adapted from Nourished; a Cookbook for Health, Weight Loss, and Metabolic Balance. Corned Beef Hash, Rutabaga Faux Potatoes. Bookmark.